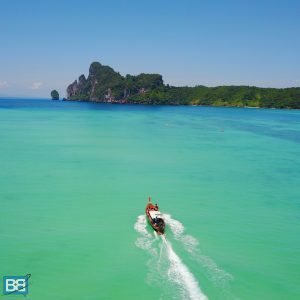 Drones are fast becoming the next big travel accessory – with aerial pics and video creating a serious case of wanderlust all over your Instagram feed! And the new DJI Spark looks like a serious contender for anyone looking to find the best drone for travel – compact, powerful and surprisingly affordable..it seems to tick all the boxes. I spent the a few weeks in Thailand and the Maldives putting the DJI Spark through its paces on the road – from kayak trips and island hopping to dive boats. So Is The DJI Spark The Best Drone For Travel? How Tiny Is The Spark?! The first thing that totally blew me away when unboxing the DJI Spark was how freaking tiny the whole thing is. Seriously my iPhone 7S is bigger than this drone and it only weighs 300g! It even makes the Mavic Pro look like a beast – the whole thing is actually about the same size as a Mavic Pro battery! 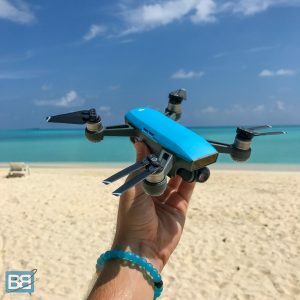 So yeah when it comes to portability even when in a case the DJI Spark is amazing on space – which is obviously a huge factor when deciding on the best drone for travel. There are obviously some trade offs with the small size of the Spark though – most notably the fact the battery life is about 15 minutes. Now 15 mins is still great all things considered, but it does mean you need to be a bit more on the ball about what you want to shoot and I’d certainly recommend investing in at least 1 if not 2 spare batteries for it. Alongside portability is the fact the DJI Spark is designed to be used straight off the bat with your smartphone. For the average traveller the range of 8m high and 30m radius is going to be ample room to create some awesome videos and photos – however this will be a big limitation for those more serious about their drone work. However there is a solution and the Spark Remote increases this range massively to 500m high and a 2km radius – heaps of creative freedom and more than enough for most people. 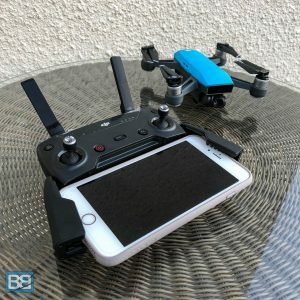 Personally I’m not a huge fan of flying it smartphone only as the responsiveness and control of the remote is much more suited for getting solid footage, so if that’s the main reason you’re grabbing a drone it’s worth seriously considering the remote too. With the smartphone as a controller you can get the Spark up in the air super fast – in fact I’d go to say it’s even quicker to setup and fly that the Mavic Pro. So if you’re flying this way happy days! If however you’re using the remote you might find everything a bit slower the get going and this is my biggest issue with the DJI Spark. Unlike the Mavic Pro remote which plugs directly into your smartphone and then connects with the drone the Spark uses a different interface (I wont bore you with the geeky details but basically it allows the Spark to be smaller and cheaper) and you have to connect your smartphone to the remote via wifi and then connect the remote to the Spark. And I’ve found there to be a lot of issue with this process and I’ve had to reset the remote and the pairing on more than one occasion to get everything to work smoothly, or my phone simply isn’t picking up the wifi signal from the remote. This has meant on a few occasions I’ve simply given up with the Spark and setup the Mavic which I was also luckily barring with me too. Obviously this is not ideal – especially if you’re either not super tech savvy to get everything fixed quickly or are shooting with a tight time constraint, which is usually the case when travelling. Even though the DJI Spark is packed into a small size it doesn’t sacrifice the awesome range of intelligent flight modes which make DJI drones so easy to fly and produce amazing footage with. In fact the DJI Spark even has some extra intelligent modes that its big brothers the Mavic Pro and Phantom don’t have yet! 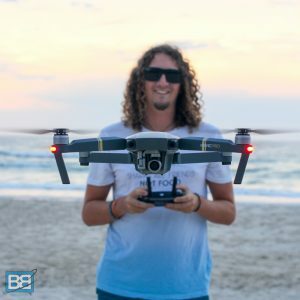 Palm control and landing – palm landing was one of the biggest things I was excited about as it gives the Spark a huge advantage on flying in confined spaces or on boats/beach which I tend to do a lot of. It’s kinda scary at first but you soon adapt to it! It also boasts other gesture controls and tap fly but honestly I haven’t found the need to play around with them too much. And alongside these intelligent flight modes is the fact the DJI Spark boasts much the same user friendliness the rest of the DJI range have – which is ultimately one of the reasons they’re so popular as drones. The interface on your smartphone has pretty much all the same details and controls – although with the more limited range of shoot modes comes a slight trim back on the creative control you have access to, something you need to keep in mind when deciding if the Spark is right for you. Overall from ease of use there’s nothing much I can fault (except the whole controller connection thing) and the drone is super simple to fly. For newbies you’ll find it super easy to pick up and you’ll be flying in no time. For those seasoned drone pilots there’s nothing you really need to tweak and you’ll quickly discover that the Spark is super fun to fly…and despite its size it’s incredibly stable in the air. Compare that to £1099 for the Mavic Pro or £1359 for the Mavic Pro Fly More Combo and it looks even more budget friendly! This price point still sets it out from a toy drone – but if you’re looking at the Spark the chances are you aren’t in the market for something like that anyway. For anyone considering their first drone this is the perfect place to start and it can easily justify that price tag. 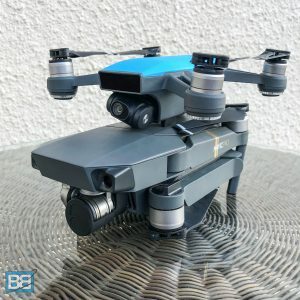 After giving the Mavic Pro such an amazing review as the best drone for travel this is going to be the main other option people will be comparing the DJI Spark with when deciding on what drone to buy – so which should you buy? The Spark Makes Even The Mavic Looks BIG! All things considered is the DJI Spark the best drone for travel and should you buy it? Well hopefully these quick fire questions will help you decide! Ultimately the Mavic Pro (despite the added size) is still going to be my preferred drone for travel – mainly because of the fact I want the higher video and imaging spec but also because I like the way it handles a bit more along with the fact in my personal experience it’s much more reliable with setup time. If you’re investing in your first drone for your travel though the DJI Spark packs some serious punch and is going to be the perfect way to get int drone photography and video though – so for more people it’s going to be more than enough to boost their Instagram game! UPDATE: I’ve now also tested and reviewed the Mavic Air – which is my new go to drone for travel! Do you travel with the Spark or the Mavic Pro? Matt recently posted..Are there any drones with a 1 hour flight time?…..We investigate!